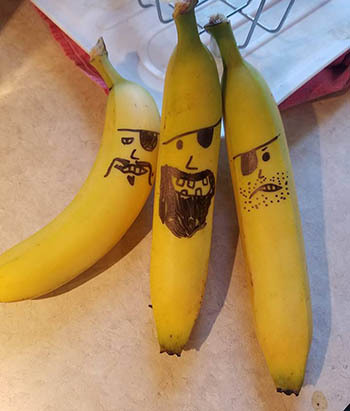 Hide a treasure box filled with banana pirates (see below) somewhere in your yard. 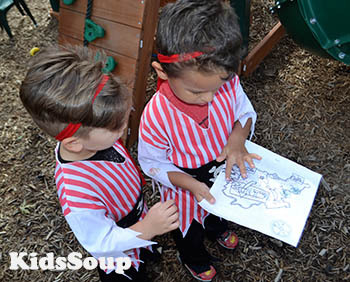 Create a treasure map to show the way to the treasure. 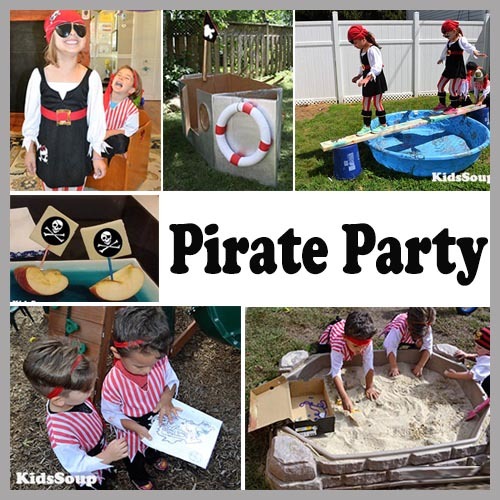 Make an eye patch for each child. Cut a “patch” out of black foam, then staple a piece of black elastic band to the foam. 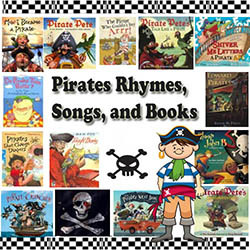 A great way to set the stage for pirate fun is to read a book about pirates. 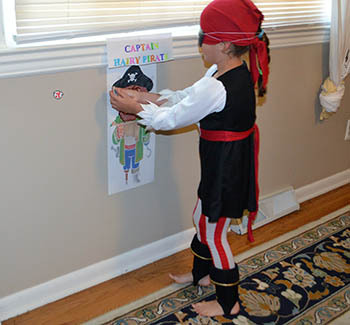 Hand out the treasure map to children. 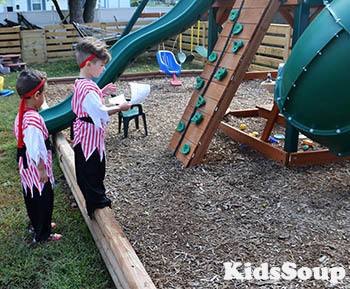 Children follow the map to the hidden treasure. 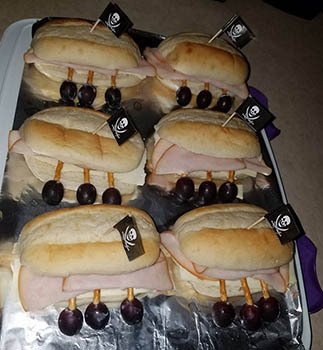 When they open the treasure, they find banana pirates or Pirate Booty for their snack. 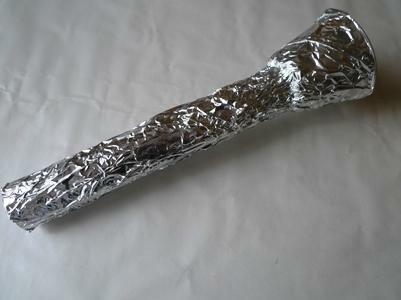 Use a simple cardboard tube and attach a clear cup with duct tape, then cover with tin foil and decorate with some pirate stickers. In advance, bury plenty of trinkets such as fake jewels, gold coins, necklaces, etc., in your sandbox. 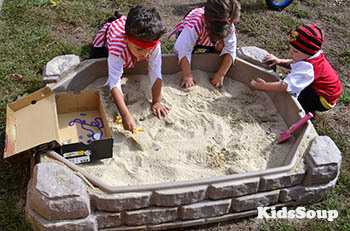 Give each child a treasure chest (shoebox) and have them dig for the buried treasures. When time is up, empty the treasures and count the booty. Provide a large box (ask home improvement stores), some craft paint, a stick or wrapping paper roll, and fabric for a flag. 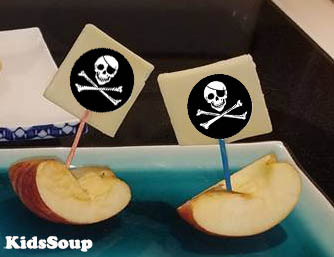 Invide children to create and decorate their very own pirate ship. 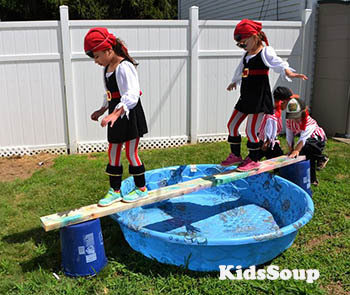 Set up a large wooden plank between two buckets or two crates. Underneath the crates, place a kiddie pool with water. 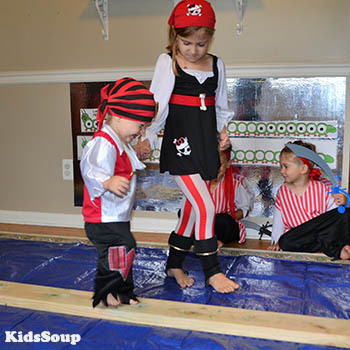 Invide the children to walk the plank and to avoid falling in to the shark-infested waters. For younger children, place the plank across a blue tarp. 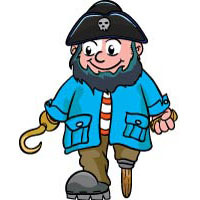 The pirates that walked the plank successfully can do it again –- this time backward, sideways, etc. This race is played like a three-legged race. 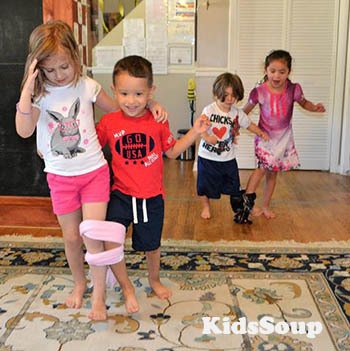 Two children race with their legs tied together to a pile of treasures. 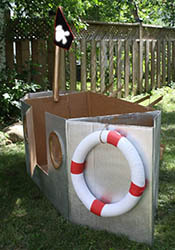 They must pick up a treasure and return to the starting line and place the treasure in their treasure chest (shoe box). The team that first brings back all the treasures wins the game. Tape it to a wall. Cut out some eye patch shapes out of sticker paper. To play, cover the eyes of a child with two eye patches. 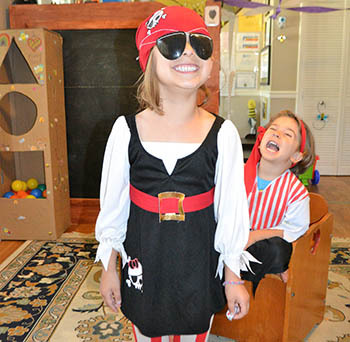 The child needs to try to stick the eye patch over the eye of the pirate.